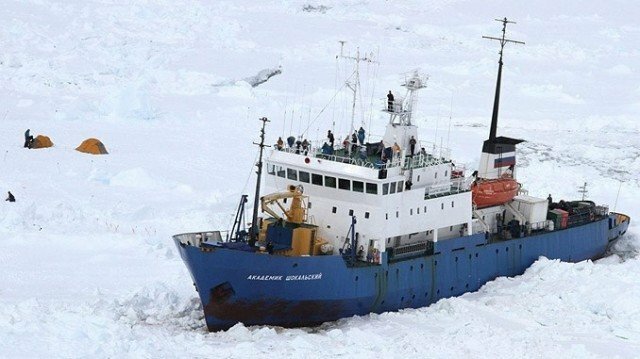 The Akademik Shokalskiy and Chinese icebreaker Xue Long have broken free from Antarctic ice where they had been stranded for several days. The Russian scientific mission ship’s captain said a crack had appeared in the ice after a change in wind direction. The Akademik Shokalskiy got stuck on December 25. It has a Russian crew of 22. On Thursday, the Xue Long’s helicopter ferried 52 passengers from the stranded Russian ship to an Australian vessel. The Xue Long then became stuck itself on Friday. “We’re going slowly and zig-zagging, we’ve already moved more than 20 [nautical] miles,” Captain Igor Kiselyov of the Russian ship told ITAR-TASS news agency. “It’s tough going so far, a lot of mist, visibility is no more than 500 metres,” he said. Captain Igor Kiselyov confirmed that the Chinese ship was also moving and that Akademik Shokalskiy was just north of it. “It may catch up with us – in that case, we’ll follow in its wake. But if not, we’ll get out together, independently,” he said. US Coastguard icebreaker Polar Star is heading towards the two ships, responding to an earlier request for help. It left Sydney, Australia, on Sunday and will take a week to get there. The Akademik Shokalskiy got trapped by thick floes of ice driven by strong winds about 1,500 nautical miles south of Hobart in Tasmania.